Office Interiors offers the best office chairs for your employees—each of which is ergonomically designed to maximize comfort and productivity throughout the day. Working in an office can mean spending a lot of time seated, which is why quality seating is so important. At Office Interiors, we strive to give you more than just a chair; we strive to provide comfortable, aesthetically pleasing, ergonomic office chair solutions that can be adjusted to meet the unique needs of every person who sits in them. Built to keep your productivity high and your body supported, Office Interiors is proud to offer our clients the best office chairs on the market today. Office Interiors has you covered when it comes to the best ergonomic office chairs for your workplace. We offer a wide assortment of seating solutions for every situation. Task Seating is designed to support employees regardless of their posture or changing work habits and positions. These chairs pair easily with the look of any office, while offering important features such as adjustable arms, seat depth, and lumbar support that enhance productivity and comfort. Executive Seating is completely adaptable, and can move from the boardroom to the CEO’s office with ease. These award winning chairs are scientifically designed to provide support to your neck and back. Anyone who sits down will experience long term comfort while they work. Conference Seating is slim enough to easily navigate a busy boardroom without sacrificing comfort or style. These seating solutions offer ergonomic support for daily meetings, and are completely adjustable, keeping every employee and client comfortable and focused. Guest Seating ensures all your seating needs are covered, even for temporary visitors. Our comfortable and stylish guest seating options feature lumbar supports, armrests, and slender profiles that make it easy for them to fit in any environment. Many of our guest seating options are also stackable for quick storage. Lounge Seating transforms common areas into multifunctional collaborative environments. Thanks to intuitive and versatile designs that include such options as built-in tablet and laptop arms or power and data ports, our lounge seating solutions allow employees to remain productive even when away from their desks. If you’re looking for the best ergonomic office chair for your needs, let Office Interiors help. 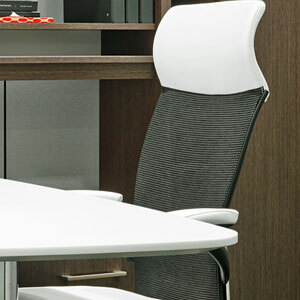 Office Interiors is the premier supplier of office chairs and furniture to workplaces throughout Atlantic Canada. We carry seating solutions from many of the biggest names in the industry, ensuring that when you sit down, you’re comfortable, supported, and ready to be productive. For more information on how the best office chair options can benefit your team, contact our experts today. To learn more about the benefits of adjustable, supportive office chairs and furniture, download our FREE Guide to Office Trends. Inside, you’ll learn how the best ergonomic office chairs can dramatically improve the productivity of your entire team.